A knitting needle sizes chart and a knitting needle gauge can be a very handy tool in your knitting bag. These two little tools for knitting will help you figure out the size of your knitting needles and which ones to choose for your next knitting project. You see needle sizes have a kind of numbering system. There are three numbers associated with each needle size. The sizes are marked in metric (mm), US sizing and/or UK/Canadian sizing. Sometimes the knitting needles are marked with a set of numbers too, for instance the metric sizing and the US sizing. Here's an example: A pair of my circular knitting needles reads like this: US 6 / 4.0 mm. However some of my really old knitting needles (hmm OK I'm dating myself here haha) only have one number on them like 12, and then some just have the metric number 8.0 mm. So how would you figure out the size for the older needles? First of all it will be very helpful to pick up one of these knitting needle gauges. If you click on the image it will take you to Amazon and I am an associate for Amazon so if you decide to buy it I will receive a small commission. All you do is poke the needle through the holes to find out exactly what size it is. Then you can check down below on the needle conversion chart to see if it's the right size you need for your project. So Why All The Different Numbers? All those factors will determine which numbering system will be used. And by using a handy knitting needle gauge and needle conversion chart you'll be able to see at a glance all the knitting needle sizes and find the one you need. When you purchase needles in the store you'll notice that there are two knitting needle sizes on the packaging. One size is for the diameter of the needle and the other is the length. The most important size you need to look for is the diameter. This number will determine the size of the stitches on your knitting needle and ultimately the size of your finished knitting project. The thicker the needle the bigger the stitches and the thinner the needle the smaller the stitches. It has to do with knitting gauge and it's something I will teach you about as well. The length of the knitting needle is more of a personal choice. Of course if you will be using lots of stitches then you will definitely need the really long needles. However if you aren't going to be knitting with a lot of stitches you may actually enjoy knitting with a shorter knitting needle for comfort sake. I really enjoyed using the smaller needles when I could. They were much less cumbersome. I still use them once in awhile but have switched over to using circular knitting needles most of the time and knit flat with them just like straight needles. I have carpal tunnel in both my hands and find the circulars easier to use. It's all a matter of personal preference. Below I have made a knitting needle conversion chart for you to have a look at and then download if you like. Just slide it into your knitting bag so you can access it easily when you need it. That way you will be prepared for whatever size needle your pattern calls for. 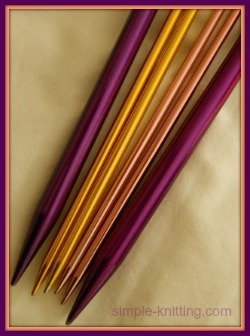 Here is the link for the knitting needle sizes conversion chart.